Those businesses often require access privileges to company data at different levels of authorization.These QuickBase apps can run on iPhones, iPads, and Android smartphones and tablets. For example, a Sales VP may have a higher level of authorization than regional sales people have. While the Sales VP may access sales results in all regions, an individual sales person might have access to sales results only in his/her region. When an end user logs into their QuickBase ViziApps app, their login credentials will automatically determine which data to select depending on their level of authorization. Here's how it works. 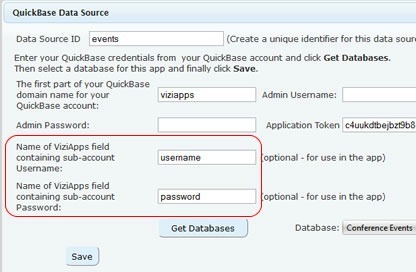 When you register QuickBase as a data source for your ViziApps app, you will see a dialog box like the figure below. Add the field names in your app that will be used for end users to login and access your QuickBase data. Then, when the app runs, your users just login and the data query you designed in ViziApps uses the authorization from their login. Also, the ViziApps Studio now enables you to specifiy a limit to the number of responses for any data query, since large data sets may have much more data than is needed by a mobile user.